This fully adjustable Tenoning Jig fits left- and right-tilting table saws with 3/8"H x 3/4"W "T" shaped miter slot, while handling stock up to 3-1/4" thick. It has an adjustable guide bar to control sliding friction/precision in the miter slot and two large handles for to help ensure smooth control. The bevel angle is adjustable from 90° to 75° and the backstop is adjustable from 90° to 45°. The multi-position control levers and extra-large clamping handwheel also ensure accurate and repeatable results. Additional assembly required for left-tilting saws. Only used a few times, but I feel so much confident the material I am machining is secure. The "Back Support" (described on p. 13 of the owners manual), unlike the rest of this jig, is incredibly flimsy. It is difficult to position, and when locking it in place it is so flimsy it cannot be locked without distortion. Everything else about the jig is excellent, solid, nicely massive, and stable. I got this tenoning jig to help cut the time spent cutting more than 140 tenon cuts on a furniture project. The tool came well packaged and the set up was a snap. With a little time spent tweeting the cut I have been able to make snug M/T joints with out the need to custom fit each joint. It fits my old model Craftsman table saw mitre slots with out the T-slot feature. After watching some u- tube videos i bought the jig its well made and very heavy duty I am still fine tuning it to fit my saw! At this point I have shimed the t-track guide on the handle end about 10thousands but after I got it to run free in the t track I found that its a good.0040 out of square on the face so I have some more work to do before my first test cut will keep you informed on my progress. But its very well built and should give me lots of years of service. Still figuring out all the ins and outs and how to use, like it very much. More than just a rezoning jig. I have found multiple uses for it. Sturdy construction. Easy set up. Great tool. It was out of stock for so long and then it finally came. It would have been nice to get it at the sale price a couple of weeks later. This is my third purchase from grizzly 0690 tablesaw bench top drill press and now tenon jig . Very satisfied with grizzly. I only wish that they would make steel extension wings for there table saw. Next purchase going to be a jointer. Works great, minimal tweaking to make clean and precise cuts. I put up for years with a very simple jig for my table saw. It could be used for make tenons, but it took a lot of patience to get it right. Finally, when I decided to make a copy of my grandmother's Mission-style rocking chair, I needed a "real" tenoning jig. The Grizzly seemed to be the best value and it did live up to my expectations. I did need to add some shims to get the bar to fit perfectly in the miter slot on my Unisaw. I replaced the travel scale with one made from an old drafting scale,but it is still best to measure the actual distance to the saw blade. No home made jig is going to work as well and as safely as this on from Grizzly. I bought this for my husband for Christmas. He loves it! 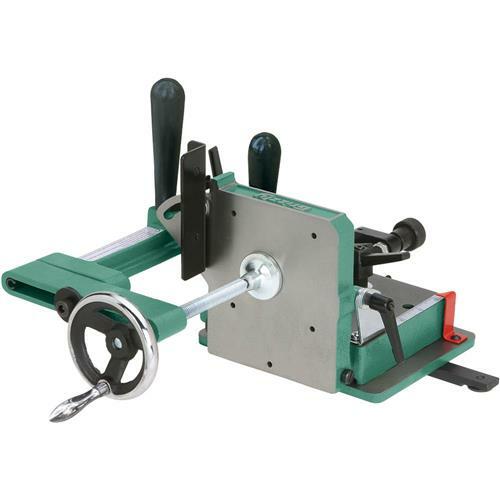 ordered this tenoning jig on a Monday received it by Friday , it was set up for a table saw with a "T " slot guide, but by simply removing the wheel on the carriage it converts to a standard 3/4x 3/8 slot . The only problem I encountered ,was the unit was saturated with a preserving oil and wrapped in plastic , a quick bath in brake cleaner made it all better . After reading the instructions assembly was a snap , setting it up on the saw ( 30 yr old Rockwell Delta ) was easy . As far as working with the jig, I found it to be very easy to work with and would not hesitate to recommend it to others . When I received this tenoning jig The base was warped. I was a Tool & Die maker before I retired So I used a file to straighten the bottom corners so it would sit flat on my table saw. Once this was accomplished the jig worked fine. This is a solid device that works well and is pretty easy to adjust for accurate cuts. Setup instructions are easy to follow. So far, I've used it to cut 12 tenons in cedar 2X4s. My only complaint is that it came DRENCHED in an oily, viscous fluid. Literally, it came out of its box and interior plastic bag dripping this fluid. It took some effort to clean it up to make it useable. 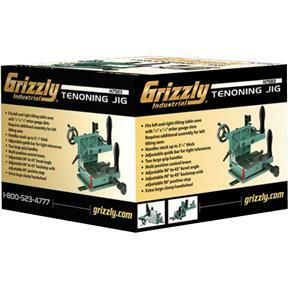 The Grizzly tenoning jig is well made and a must have. I am 100% pleased. I needed this jig to build some old style window sashes. I was skeptical based on reviews I've seen around and was hesitant. I needed a jig so I took a chance. Well I'll say that I'm impressed so far. It has worked very well and is pretty easy to use. Using brass setup bars were really handy. I don't really like the stamped sheet metal bracket for the lateral support, but it is fine. Always use a high quality machinist square to align everything. Pretty good jig. Can handle larger pieces than my home made jig. The 3/4" guides on my Rockwell saw table did not allow for the round adjusters to set into them. I had to remove them and then the guide bars had to be adjusted at somewhat of a "sliding bind" to get the jig to fit snugly in the tracks. This is not addressed in the instruction manual, either. This meant more fine adjustments on other parts of the jig. Overall, it is a heavier, more precise piece of equipment that I highly recommend as an addition to any woodworkers shop. Very glad I made this purchase. It makes making tenons a breeze. Would recommend it to my friends. I've used it to several cuts. It's outstanding and extremely accurate. This is the right tool for the job. I purchased the tenoning jig to use on a outdoor furniture project. When it arrived, it was covered with a thin oily film that was easily removed with Simple Green. It took some time to set up and adjust but nothing out the ordinary. For me, that's part of the fun in purchasing and using a new tool. I cut tenons on 44 boards and the results were very good. I'm very happy with my purchase. Superb service, delivered to West Australia within ten days. Jig is accurate, easy to assemble, setup and use. This item came damaged in shipping but your customer service supervisor sent another one out right away. I THINK HEAVY ITEMS SHOULD BE DOUBLE BOXED BECAUSE THE SHIPPING PROCESS IS BRUTAL. China-made, but there's not much you can do about that these days. I would suggest (2) tweaks to improve the performance. I inserted 0.020" shims between the rail (the part that travels in the t-slot) and the base of the H7583. On my table saw, at any rate, there was too much binding. (You could also insert thin #10 washers between the t-slot washers and the rail). Also, I added a #10 washer between the slotted bracket and the face--this is where you adjust the angle of the face of the jig relative to your table saw. Perhaps there is supposed to be one here and mine went missing? Anyway, when you tighten down the handle, without the washer the slotted bracket gets bent over too much. Jig is very good, only cons the little scale sticker just peeled off on first wipe down... and needed to tear it down to move the guide rail to the other holes to get it setup correctly. Additionaly the stud fastener scratched the desk of my Grizzly table saw as I didn&amp;#39;t notice it protruding through the base. It was easily adjusted, but keep an eye out. I bought the jig in December and write this at mid February, and can honestly say it has been one of the best experiences for the money I've had. It is very easy to set up and use. Milling three dozen tenons was a snap with it. I even went back and re-cut/adjusted boards I had attempted before it had arrived! Worth every cent! I was very pleased with the jig after some assembly adjustments. It has all the material adjustment capabilities to secure the workpiece. It moves smoothly in the miter slots and has adjustment screws in the slides to engage the slides slop free. The fine adjustment knob makes precise cuts easy but the location indicator is for rough approximates only. Repeatability is a challenge but careful layout and setup is does the job it was designed for and has meet my expectations, especially for this price point. I had been waiting about a year for this jig to go on sale, and it did right before Christmas. It thoroughly out performs the shopmade jigs I had been using until now. Haven't used it for more than a few test cuts, but it looks like it's going to work out just fine. Plenty of adjustment to get it dialed in. I bought this jig with my table saw and was very surprised to find such a solid piece of equipment when I opened the box. I did not imagine something of this quality for the price. 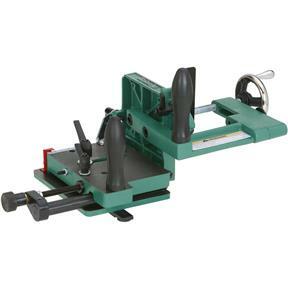 i have used and had very good success with the tenoning jig. I love it. Only one thing though. Is there a way to tighten it in the miter gauge slot? This jig is as fine as any other on a professional level. (1) The little formed bracket/fence that holds your part square to the table and to the main vertical plate needs help. The bracket/fence was not square or straight. Luckily, it's easy enough to bend and with a little patience you can get it both square and straight. (2) That same bracket/fence does tilt back by design, but to get it up to 90 degrees to the table you also will need to take a file to the back side of the casting where the lock knob washer rides to allow it to get all the way up to square. The fillet in the casting plus the paint cause it to back up every time you tighten down, which kept mine from getting all of the way to 90 degrees. (3) The casting and the hold down arm brackets interfered slightly, and I couldn't get the parts assembled correctly without a little grinding on the edge of the casting. (4) The oil that Grizzly generously soaks this thing in to keep any corrosion at bay also dissolves the glue they use to attach the distance scale. That will need to be cleaned and glued back down. This does give you the opportunity to put zero where you want it for your particular saw. Haven't had a chance to use it yet. Wanted for later. I would buy this again. The jig works as advertised. The stick on measuring tape did not stick and it was only graduated in 16ths. Maybe a gauge on the adjustment knob would be better. As everything that I have with the Grizzly name on it, this is another great item. Very heavy and well built. I've made an initial tenon with it now I need more time to start making the furniture! Very heavy duty. Instructions were a little hard to understand putting it together. But overall very good. Used this for the first time it works great. I made tenons for two cabinet doors, did a beautiful job! I'm very happy with the results.I also ordered two aluminum rods for a 45 degree homemade angle sled with the adjustments on the rods, there is no play in the sled, makes perfect cuts on my table saw. VERY happy with this purchase! 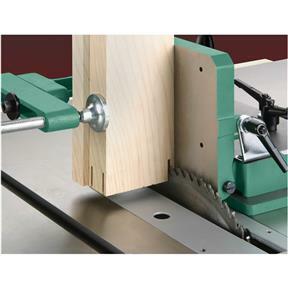 This makes tenoning safe on a table saw, easy to use and assemble. The jig works just fine. After completing set up cuts are accurate and repeatable. Excellent product worth the money. Works great! Very well made and excellent price. Makes my tenons accurate and keeps my hands safe. Love it. I bought this with my new table saw. Haven't had a chance to use it yet but love it's beefy construction and great delivery. it appears to be very well built looking forward to using it. This jig worked great, It did not slide well in my Delta table saw at first, had to play around with the adjustments of the lower rail but after working it in, it seemed to smooth out and glide well. Adjustments worked very well and gave me some consistent cuts. Looks good, my shop is in NM so will try in March. I have been wanting one of these for a while after seeing a friend who had one. This makes tenons sooo much easier to make. I wish a had purchased this a long time ago. Got this Jig because I always wanted one and saw this in a sales email from Grizzly. My impression when I got it was that it was a lot of Jig for the money. A lot of people make do with homemade Jigs because of the cost and this Tenoning Jig really takes that argument away. A lot of machining for not a lot of money. I am very pleased with my purchase. Have not had a chance to use this jig yet, though I am sure it will work out well. I just need to start another larger project that will take advantage of this jig's capabilities. It works very well with my old 1950's Craftsman 10 inch table saw. Assembly of the jig was a breeze. I was very pleased to see the allen wrench set needed for assembly that are included with the jig. 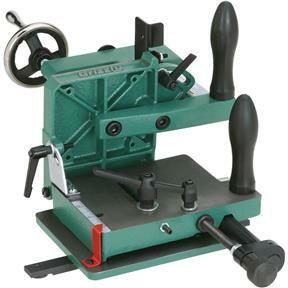 This jig does a great job and is easy to set up for various tenons and other applications. I have been using it to build kitchen cabinets and it works great. Thanks! The only issue I have is that the water reservoir needs a taller lip on the leading edge. With the accessory kit #2 I was able to put the correct bevel on my wood lathe tools. Im very happy with this product. Easy to put together and true. Too much grease. I bought this about 6 week ago and I'm glad I did. It saved a ton or time and made the Tenons much easier to fit. After a little fiddling to make it fit my was, it worked like a dream. Wife gave me one for Christmas and just got around to setting it up. Adjustments are simple and directions are easy to follow, if you need them. Two small problems were encountered however. There is, or was, a 3" scale on the base below a pointer to be used to set depth of the tenon shoulder. I say was there until the protective oil that covers the jug crept under and dissolved the adhesive. I will try to reattach with some thin 2 sided tape I have or perhaps etch it into the metal. The second problem is more serious in my mind. There is a safety stop screw on the left side of the jig that is to set up against the slide locking bolt to prevent the face of the jig from contacting the saw blade. With the guide bar in the proper position for my saw and the blade just touching the face of the jig, the stop screw is about an inch short of reaching the locking bolt rendering it useless. The screw that came with it is metric, 2 1/2 inches long. I'll need to find one about 4" long, full threaded or buy the proper die and make one. Q: Will the H7583 tenoning jig work on the G0771 Hybrid Table Saw? 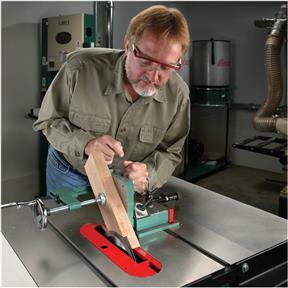 A:Yes, this tenoning jig will work with the G0771 Hybrid Tablesaw.